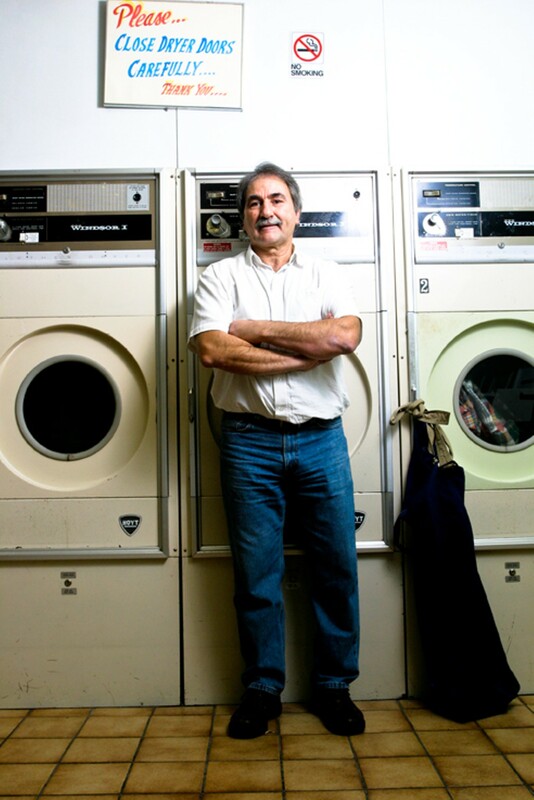 Editor's note: With its latest Best Laundromat win in 2008, the Bluenose was elevated to the Best of Halifax Hall of Fame. The place hums in that comforting way laundromats do. Thirty washers and 15 front-loading dryers fill the room, sometimes all working at once. The TV is usually set on TVtropolis, a turning cycle of its own, '90s sitcoms in rapid succession. A pair of ceiling fans keeps the air moving, spinning counter-clockwise while the driers spin clockwise. The room is never less than cozy. Maybe that's why the Bluenose has won 12 years' worth of Best Laundromat plaques. It's like your living room, but with more appliances. You just don't mind hanging out while your socks are doing their little hop. And the Zelioses are always around to chat to customers, or to offer change, a wash-and-fold service or dry cleaning. Fourteen-and-half hours a day, seven days a week, for 15 years, either Bill or Maria Zelios has been there. They own the building and lease out the storefront restaurant space at the corner of Duncan and Windsor that George & Lito's currently occupies. Up above, there are rooms for rent, though the Zelioses plan to renovate and turn them into apartments. The whole building is its own small business, keeping them occupied, but with a grand, overall scheme. "I can't say anyone enjoys working 12 to 15 hours a day," says Bill in his distinctive Greek accent, punctuated with a gruff smile. "I'm not a hero! But if you have a plan, a family, you have to work." Bill and Maria did not graduate from university, but they are sending their two daughters to Dalhousie and Mount Saint Vincent, taking care of their expenses and education until they graduate in 2009 and maybe even beyond, into graduate school. "It's a better future for them," says Bill. "That's the reason we do it." While we chat, we're interrupted three times for dry cleaning pickup, wash-and-fold and change. Bill knows most of the names of his customers and is always quick with a smile. His first lesson in Nova Scotia customer service was many years ago when he first moved to Canada and worked at the Poseidon eatery in Scotia Square. Because he was Greek, and so was the menu, the owner put him up front to handle customer service. One day the boss took him by his arm into the back room and told him to smile at the people. "You have to be nice," says Bill. "It's a small town with too much competition. You have to have that insight for service." And the service at the Bluenose is, and has always been, excellent. As Bill and Maria say, you don't need advertising when you have the regulars who spread the word. But as the times and the economy have changed, so has the business. "I remember from '94 to '99, it was more busy but the prices were lower," says Bill. At the time, a wash was $1.25. Now it's $1.75, but the cost of oil and propane is three times more expensive than it was then. Also, as a small business, they have to pay for garbage collection and other utilities. "I work harder for less," Bill says. "But everybody works hard. I'm glad my daughters, in another few years they finish. I see the light at the end of the tunnel!" He laughs and greets another customer. And the machines? They just keep right on humming.